Day Z: Solving the Bandit Problem | SPACE-BIFF! Searching for food along the coast. Last time I took a hike in Day Z, the hot new mod for ARMA 2: CO, I went looking for buddy Digital Pariah only to end up out of ammunition and trapped on a rooftop with a very agitated zombie. 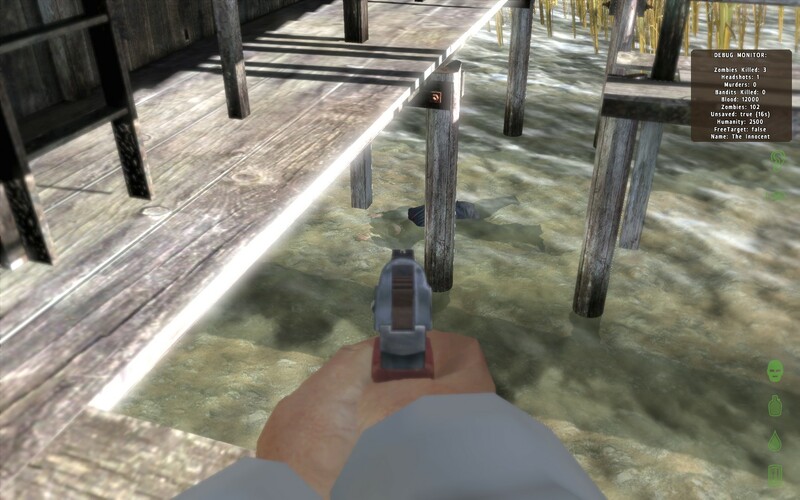 As it turns out, I was incredibly lucky to die of mastication/falling, as most rookies are killed by pesky bandits, who prey on the weak for their Makarov bullets and tins of beans. 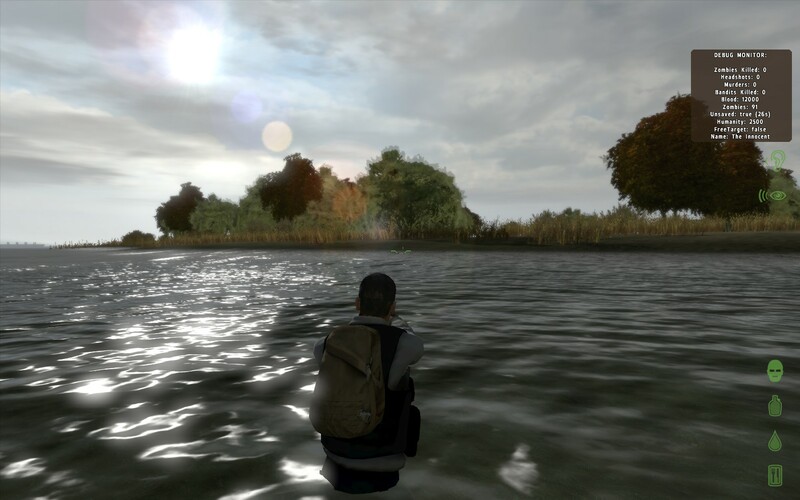 So for my next outing, my goal was not only to avoid major populated areas (and thus, zombies), but to figure out some way to deter the bandits that stalk the shoreline of Chernarus. I think I’ve found a solution. Though when I say “solution,” I don’t mean it precisely. The view from the other side of the border. I don’t know what I was expecting. I figured I would eventually run into something if I walked far enough. 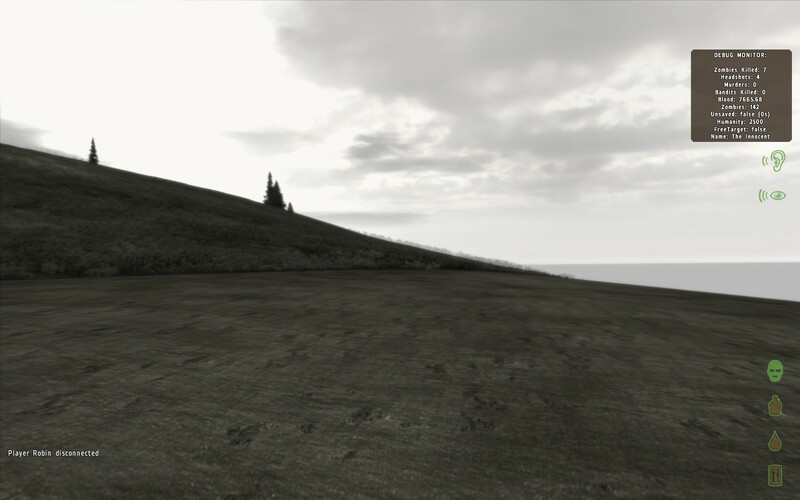 And find something I had: I’d avoided bandits, zombies, scavenge, and everything else, and found barren hills of dirt as far as the eye could see, separated from Chernarus by a sharp line. The prospect of hiking back was so depressing that I chewed on the end of my Makarov. Experiment successful. Inside a coastal fishing shack. Back on the coast, I decided to try a different tack. Instead of taking to the hills, I would find the bandits and harangue them the way they’d done to me. 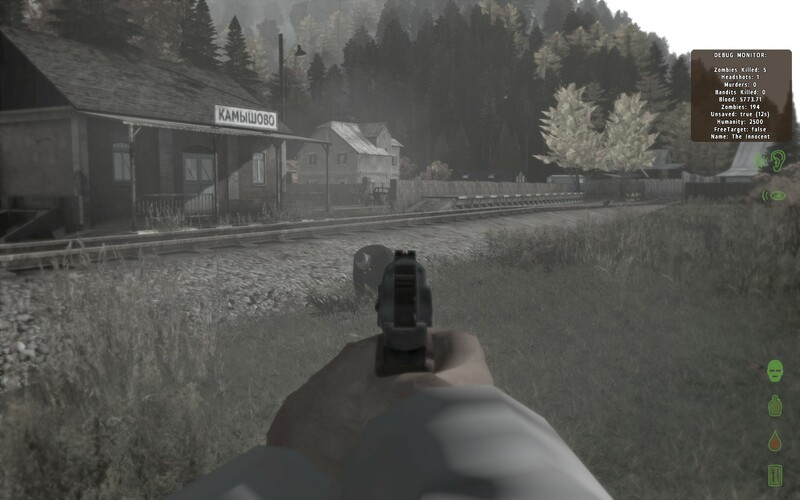 So after searching a small fishing shack and finding more ammunition for my pistol (and also falling off a ladder and breaking my leg thanks to that same pistol magically pushing me backwards when I reached the top), I headed into a town called KAMbiWOBO. Or something. I’d heard gunfire from that direction a short time earlier, and it seemed as good a place as any to start my hunt. I battle zeds at the KAMbiWOBO train station. 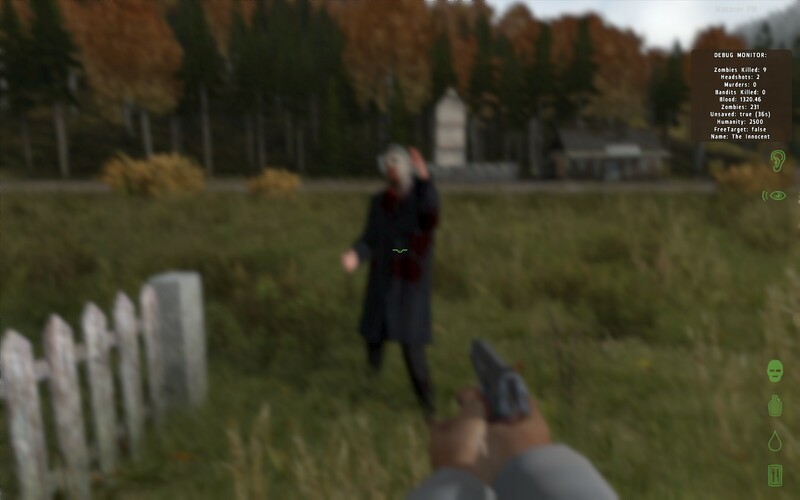 Almost immediately, I was attacked by a small pack of angry zombies, probably riled up by whoever else has been shooting. Even worse, after wasting my time and ammo on the attacking zeds, it seems that the racket I was making had attracted the same person who had drawn me to this little town. At first I thought the gunshots were echoes of my own, but the empirical evidence of rounds slamming into my body armor refuted that theory. I made a mad dash to the other side of the train station, where I slumped against a wall and pointed my gun at the corner, ready for whoever might appear to finish the job. Waiting for my killer to appear. I was oozing blood. I was hungry and thirsty. I had a second broken bone, and my vision was blurred. I found myself twitching at shadows, hoping that my attacker would prove overeager and run into my sights, but something told me that he would be too smart for that. He must have known that he had hit me a few times—all he had to do was wait a few minutes, and everything I was carrying was his. The thought made me perk up. Everything that was mine. So I cracked my can of soda and downed it in one go. I peeled open my tin of beans and scarfed it down as well. I emptied my canteen and hid it in the tall grass, ruined the last of my bandages on my wound, and fired what remained of my bullets into the air, reloading deliberately and thinking that my assailant must be thinking that I was fending off a zed or two. And finally, when I was ready to die, I took my flares in hand and ran into the open, tossing them all over the place. Come get it, big guy. The festivities drew another zombie out of some hiding spot, and he chased me around as I burned through the last of my flares. Then I stood my ground as he clobbered me. As I lay in the grass, I watched as the zombie was thrown to the ground by automatic fire, and listened as someone approached, eager to get at the contents of my pack. I blacked out listening to those footsteps, and wished that he could have seen the smile on my face. Okay, so I didn’t find a solution to the bandit problem. I sure did find a way to piss off my killer though. Did I mention that I’m now in love with Day Z? 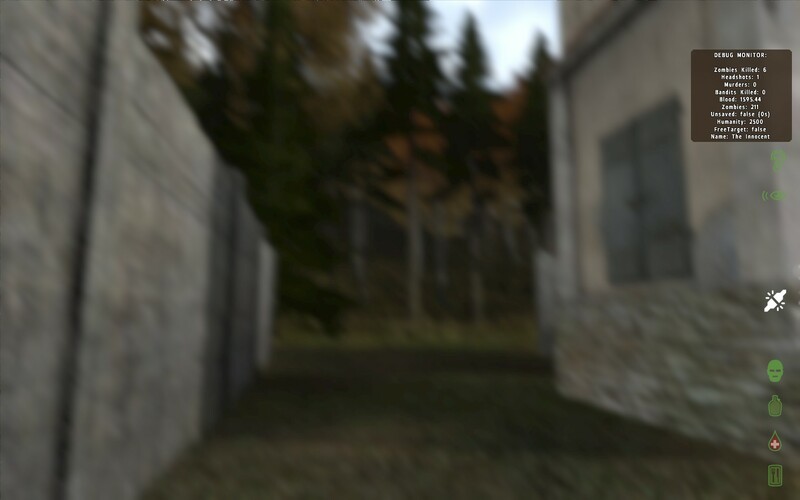 Posted on May 16, 2012, in Mod and tagged ARMA 2, DayZ, Mod. Bookmark the permalink. 2 Comments. You’re on the verge of convincing me to buy ARMA 2. For a mod. Stop it!